What brings me to my garden every morning? I often wonder if it is the memory of my granddaddy’s large vegetable garden across from the parsonage in Alabama, or my grandpa’s hog farm in Ohio. All I know is that gardening brings me joy and peace. 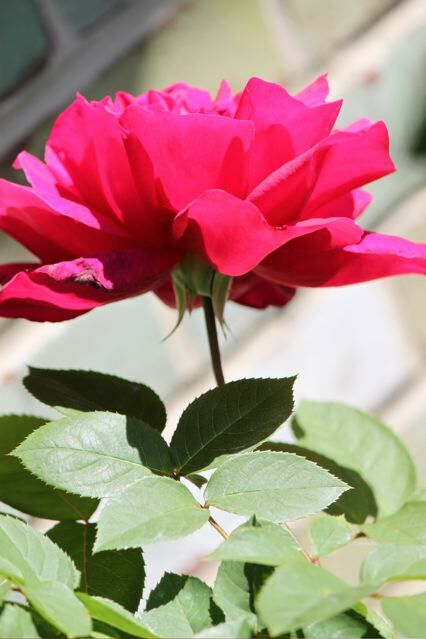 I view gardening as a spiritual practice—it is an easy way to regularly connect to and meditate upon the Divine. My time is after I get the kids off to school and my husband out the door, and after my tea. This is my morning ritual before work or play. During my time in the garden I often remember the scriptures about gardens. In Genesis 2 we find God in the Garden of Eden, in Mark 14 we find Jesus in the Garden of Gethsemane, and in Revelation 22 we find an orchard that has the power to heal all the nations. 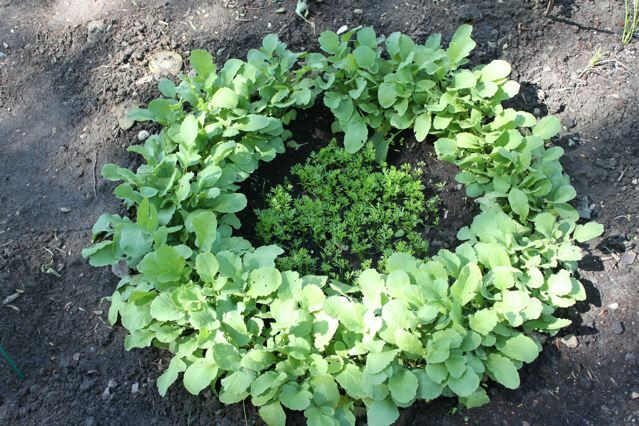 This year I added a ring of radishes and carrots to my spring garden. While I live in the suburbs of Chicago, I do have a small rose garden with a few tea roses, spray roses, and knock out roses. I have an herb garden so that when I sing the Simon and Garfunkle lyric “parsley, sage, rosemary and thyme” I can sing it with a flare of authenticity as I pop miniature strawberries into my mouth plucked from beneath the chives. I have a modest vegetable garden with peppers, tomatoes, eggplant, cucumbers and the like. And this year I added a spring garden to my repertoire with root vegetables of radishes, carrots, beets, and lettuce, spinach, and sweet peas all grown from seed. Now, I know as you read this you are imagining someone else’s garden—one that actually produces enough to eat and more than enough to share. But unfortunately that is not my garden. 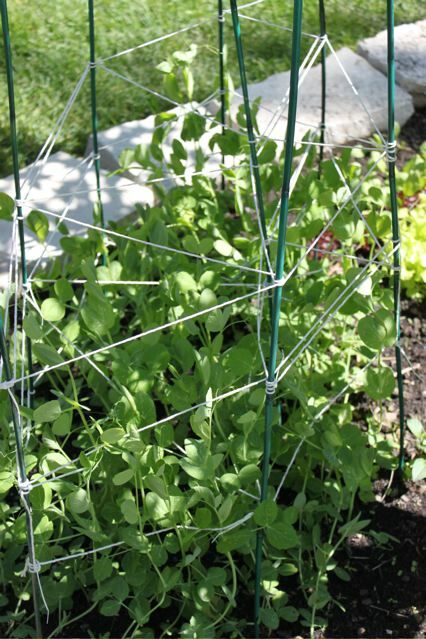 My handmade trellis from bamboo and string for my spring peas. Like anyone who dares to plant a tomato plant in the ground, or who puts seeds in a row, I hope for a harvest beyond what we can consume. I am always looking for the “hundred-fold harvest” that Jesus talks about in Matthew 13. I want to haul in baskets full of carrots and beets, bushels of tomatoes and peppers, and armloads of basil for pesto. But, there are more pests, than pesto in my garden. 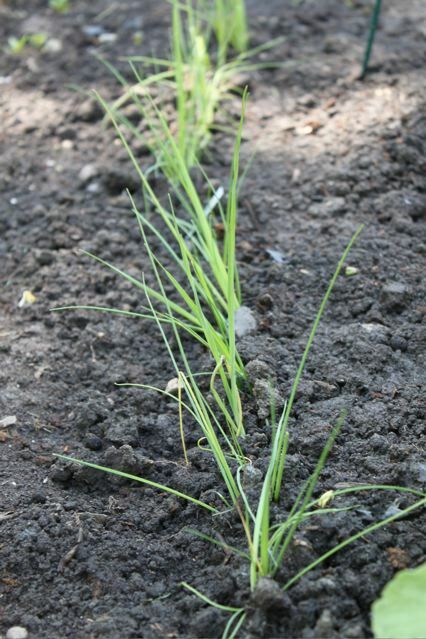 After digging up rocks and adding good earth, I have a little row of leeks. My garden struggles against the elements to produce a humble harvest, certainly not enough to share…yet. Last year I collected 4 little eggplants because my plants struggled all season. I harvested perhaps 10 pods of peas. Well, not really. My kids stood in the garden with me and we ate the sweet-pea pods right off the vine—it only took a couple of minutes. The joke is that I am an “organic” gardener only because insects and diseases have a fair shot at all my plants because I don’t work very hard to keep them away. In Matthew 13 Jesus talks about the difference between the seeds that are chocked out in the rocks and the seeds that produce a hundred-fold harvest. That simple difference is the good soil. In other translations, the phrase “the good earth” is used. I am always working on how can I take the earth of my suburban home and turn it into the good earth that produces a bountiful harvest. How can I take what life has dealt me and turn it into a harvest I can share? The truth is, a hundred-fold harvest is really a miracle. Ten-fold would be great, that is for one plant to give 10 eggplants would be wonderful. To produce prolifically, say a thirty-fold harvest requires skill, knowledge, proper sprays and ferterlizers at just the right time, and dare I say a good deal of blessings of good weather and rain from above. In short, the garden that we imagine takes a lot of hard work to create, and quite a bit of good earth, and God’s blessings of good sun, warm nights, and life giving rain. I want the hundred-fold harvest, but do not want to put in that kind of time. So I am what you might call an accidental gardener. If my garden does well, it is a bit of my toil mixed in with the right blend of accidental good fortune. My zucchini from last year was prolific. 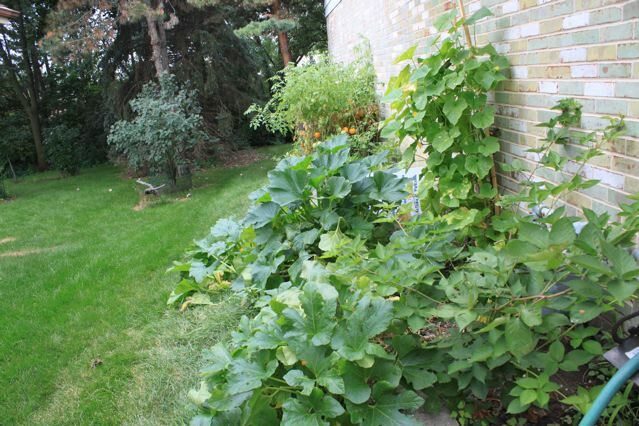 Last year my zucchini plants produced enough to feed my family for three months—much to the grumbling of my father-in-law. I learned how to cook zucchini in so many ways—how to hide it with potatoes, mix it into salads, top it on pizza’s and cook it in quiches. It in the peak we ate zucchini every day. So my father-in-law begged me to grow something other than zucchini this year. This is why I added cabbage, cauliflower, onions, and beets. We shall see if I have an accidental harvest this year. Whether the harvest is good or not, every day I go out to my garden, tend it, water it, weed it, and occasionally even harvest a few vegetables here and there and all the while I am meditating on the good earth and the good God who put it there in the first place. Why not plant a small garden this year? A container garden of spring veggies from seeds. Spinach, lettuce, peas, radishes, and carrots. May you plant a garden this year, its not too late! 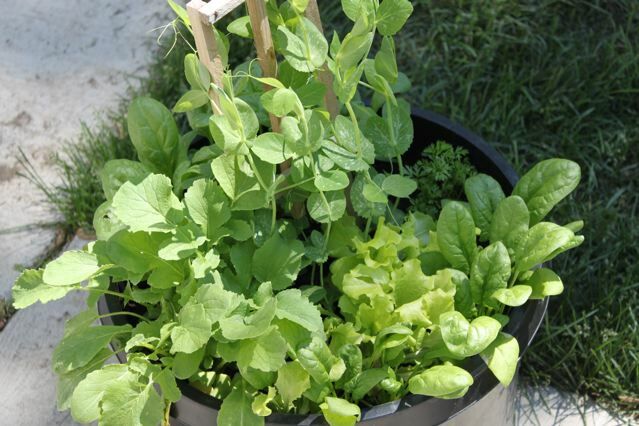 Try a container garden, or a small patch of cabbage or tomatoes. As you tend your garden, may you experience God as you tarry there. Whether or not you experience the joy of a hundred-fold harvest, I suspect you will stumble upon a spiritual harvest greater than you imagined. Peace to you and GOoD gardening! PS: Stay tuned for quick updates on my garden this summer under the heading, “My Blooming Garden” to see what’s blooming, what’s fruiting, and what the daily harvest brings. I am a joyful, practical, faithful world citizen engaged in ministry in the midwest. These are my musings about spirituality, faith, family, activism, beauty, and congregations without walls. All the images are my original photography. I photograph what inspires me and hopefully these pics will inspire you too! I share my suburban life with my Indian husband, two kids in college, two cats, two goldfish, a freshwater aquarium, and a two dogs.